Waterproof short gloves best suited to 125cc & Scooter use: limited impact protection, high performance weather protection. 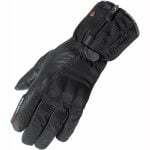 Alpinestars motorcycle gloves with a textile outer construction and the benefit of a hard knuckle. A short pair of motorcycle gloves with a Drystar Performance membrane, the ideal choice for scooter riders that need protection from the road and the weather. This waterproof membrane is laminated to the gloves to reduce bulk and ensure full waterproofing. Level 1 CE certified motorcycle gloves: These gloves are a compact pair that really just look great. They offer more protection than a lot of gloves in the same short cuff, textile style. They look smart and would be ideal to keep in your rucksack once you’ve taken them off. The Velcro closure ensures the gloves are secure whilst a touch screen finger means you can use them to operate your sat nav or phone!